Wondering where to eat in Providenciales, Turks and Caicos? 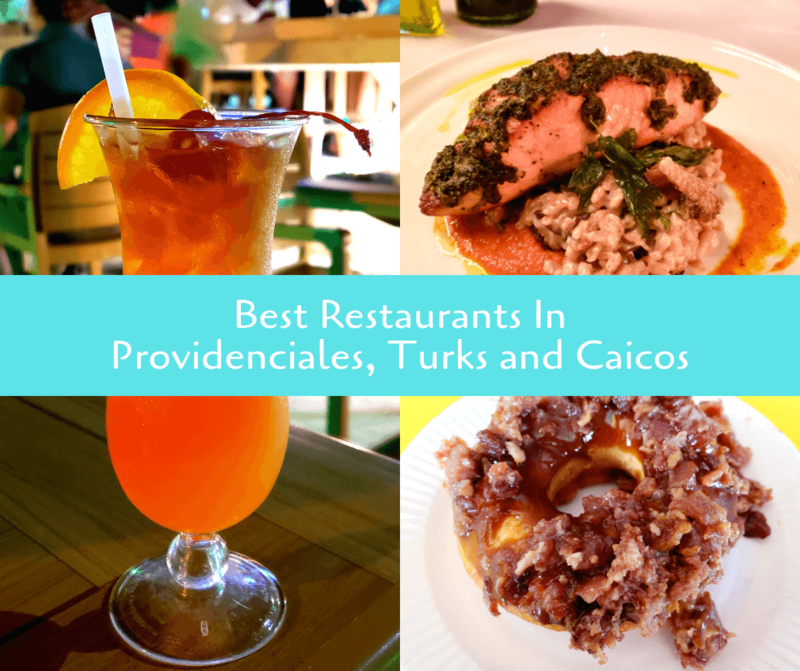 We’ve listed what we believe to be the best restaurants in Providenciales. We visited Turks and Caicos in December with the intention to relax, lay by the beach, and experience Turks and Caicos dining. Turks and Caicos is a British Overseas Territory in the Atlantic Ocean and is made up of over 40 small islands and cays. During our Turks and Caicos vacation, we stayed on the island of Providenciales, also known as Provo. Providenciales restaurants vary from casual pizza joints to high end fine dining. On our flight to Turks and Caicos we were handed a visitors guide, so we quickly started flipping through it to find the best restaurants in Providenciales and also the best Providenciales bars. The specific area on Providenciales that we were staying in was called Grace Bay. TripAdvisor named Grace Bay Beach as the World’s Best Beach In 2018 Travelers’ Choice Awards. Thanks to that, tourism is booming and there is no shortage of great Grace Bay restaurants. So below we’ve listed out what we think are some of the best restaurants in Providenciales. To say that we ate well during our trip would be an understatement! Not only is Coco Bistro considered one of the best Providenciales restaurants, it’s also considered one of the best Turks and Caicos restaurants. It’s difficult to get a reservation, but luckily when we called there was a cancellation so we were able to get a table for the following night. The restaurant was elegant and our table was under palm trees, which we loved. As we looked at the Coco Bistro menu, our mouths watered. Everything looked good, but we ended up deciding on the Pesto Rubbed Atlantic Salmon with Mushroom and Barley Risotto. It came with grilled asparagus, charred tomato romesco sauce, and crispy salmon skin chicharrones. That salmon was probably the best salmon we’ve ever eaten. It was flavorful, cooked perfectly, and the crispiness of the skin was pure perfection. We accompanied our salmon with a small bottle of Prosecco. Another one of the best Grace Bay restaurants is Skull Rock Cantina. It’s next to the Ports of Call Resort, where we stayed. The ambiance was fun and casual, with both indoor and outdoor seating. The portions were large and they had a great drink menu. We couldn’t decide between their fajitas and their burritos, so we compromised and got their Fajita Burrito. The steak inside was tender, juicy, and spiced well. It was huge, but it was so good that we ate it all! To drink we had a Skull Monkey, with Cruzan pineapple rum, creme de banana, pineapple and orange juices. Yum! Of course, when researching where to eat in Providenciales, we had to look for a pizza place! One of the best pizza places is Pizza Pizza. Within walking distance of many resorts, it’s definitely one of the more popular restaurants in Grace Bay. baby octopus, conch, mussels, clams, shrimp, crab, and herbed garlic. We, however, went with a classic Pepperoni Pizza that had our taste buds dancing for joy! When asking about Providenciales bars, one place always came up: Danny Bouys. This fun sports bar on Grace Bay Road has indoor and outdoor seating and has multiple TVs if you’re wanting to catch a game. They also have daily drink specials and events like karaoke and Country Night. They have a full food menu, but we went to try out some cocktails. We ordered the Rum Punch, which had white, dark, and coconut rums, pineapple and orange juice, and grenadine. We drank it while sitting outside on the patio, a great place to relax and people watch. If you’re looking for fun desserts, we recommend visiting Turkberry. They have frozen yoghurt, but we went for their donut bar. It’s fun to pick your toppings and see them make it on the spot. They also have recommended favorites, if you don’t want to go through the hassle of trying to pick from their many toppings. We chose the maple bacon donut, and loved the way it came out. And finally, for delicious ice cream we recommend Giggles Ice Cream. They have a variety of flavors as well as milk shakes, smoothies, and candy. Pro Tip: Check out our Best Travel Accessories Under $20. We were excited to try Turks and Caicos food and the restaurants in Providenciales did not disappoint. Everything was fresh and flavorful and the service was always really great as well. We liked that we could find a little bit of everything and still enjoy local cuisine as well. Have you been to Providenciales, Turks and Caicos? What other restaurants would you recommend? That looks like a real pizza, at Pizza Pizza. Well done Vicky. I would not believe so many rocking spots could be found on the Turks and Caicos. Looks like you had a great time eating out on the island. I’m surprised you were able to make it back onto the plane. I would have just rolled over onto the beach and let the plane go home after eating all that. Haha! I barely made it!